This is the 95th in a series of monthly reports that focus on developments affecting Papuans. This series is produced by the non-profit West Papua Advocacy Team (WPAT) drawing on media accounts, other NGO assessments, and analysis and reporting from sources within West Papua. This report is co-published with the East Timor and Indonesia Action Network (ETAN). Back issues are posted online at http://www.etan.org/issues/wpapua/default.htm Questions regarding this report can be addressed to Edmund McWilliams at edmcw@msn.com. If you wish to receive the report via e-mail, send a note to etan@etan.org. Summary: A proposed U.S. sale of assault helicopters to the Indonesian military (TNI) would augment the military’s capacity to conduct “sweeping operations” against Papuans, especially against villagers who have for years suffered indiscriminate military attacks. The West Papua Advocacy Team (WPAT), in comment, calls on the U.S. Congress to block this sale. Indonesian authorities continue to block efforts of respected international non-governmental organizations to work in West Papua. The international media freedom advocacy organization, Reporters without Borders, is calling on the Indonesian government to end its repression of journalist activity in West Papua. 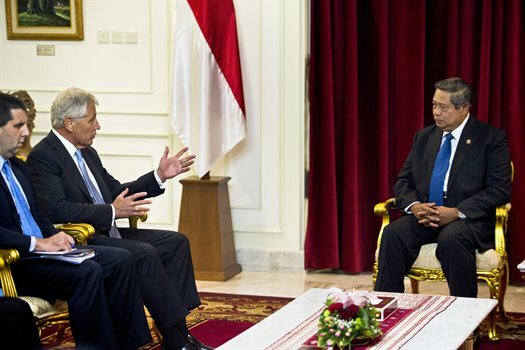 WPAT notes that impeding NGO activities in West Papua and restricting media are part of a deliberate government policy aimed at obscuring Jakarta’s repression in the region. The policy, developed by the Suharto dictatorship, continues. Papuans, demonstrating peacefully, rejected Jakarta’s latest plan to salvage its “special autonomy” policy and demanded a referendum. Jakarta’s trial of Papuan leader Forkorus Yaboisembut and others for organizing the Papuan Third National Congress (October 16-19, 2011) is off to a rocky start as prosecution witnesses prove ineffective in documenting the government’s case. The World Council of Churches has issued a “wake up call” to the international community regarding growing tension and rights abuse in West Papua. International Parliamentarians for West Papua launched its Australian-Pacific branch. On Wednesday, March 5, call +62 967 532640 and ask to speak to the Head of the Prosecutor’s Office Imanuel Zebua, or his representative. There should be somebody there who speaks English, but if not it shouldn’t be a big problem – as long as the name and the concern come across that should have some impact. Indonesia’s Deputy Minister of Defense Sjafrie Sjamsoeddin told Antara that Indonesia intends to buy eight AH-64 Apache helicopters from the United States. The sale of the AH-64 helicopters to the Indonesian military (TNI) poses a direct threat to Papuan civilians who have been the target of TNI assaults for many years. TNI “sweep operations,” including one currently underway in the Central Highlands region, include attacks on villages and the destruction of homes, churches and public buildings. These TNI assaults, purportedly aimed at eliminating the poorly armed Papuan resistance, force innocent villagers from their homes. The Papuans either flee to neighboring villages or into the surrounding forests where many die cut off from access to their gardens, shelter and medical care. The AH-64 is designed for air to ground attack. It comes with a night vision system and is armed with chain gun M230 30mm. It also is equipped with rocket pods. These aircraft will substantially augment the TNI’s capacity to prosecute its sweep operations in West Papua and will almost certainly lead to much higher cost to the civilian populations long victimized by such operations. The U.S. Congress must be notified of major weapons sales and can object to them. Employing bureaucratic subterfuge, including manipulation of visa requirements and refusal to issue travel permits, the Indonesian central government has prevented respected international non-governmental organizations from monitoring human rights developments in West Papua, providing protection for Papuan human rights workers and even from affording humanitarian services. In 2009, Jakarta forced the International Committee of the Red Cross to close its offices in West Papua. In late 2010, Peace Brigades International (PBI), an organization devoted to protecting human rights advocates around the world, ended its activities in West Papua following years of dealing with visa obstacles thrown in its path by Jakarta. PBI’s good faith effort to negotiate an arrangement whereby it would staff an office in West Papua with Indonesian personnel failed. The Dutch humanitarian organization Cordaid was also forced to end its activities in West Papua. A July 2010 directive from the Indonesian government ended the agency’s decades old work in the area of social development and economic empowerment for the poor. Indonesian authorities refused permission for Australia’s Caritas to place its personnel in West Papua. A recent Oxfam project in West Papua, intended to empower women, has operated under constraints imposed by Jakarta including refusal to allow non-Indonesian consultants of the organization associated with the project to travel to West Papua. Reporters Without Borders (RSF) on February 10 called on the Indonesian government to ensure press freedom after a series of media freedom violations in West Papua. Darma Sahlan, a journalist working for the weekly Monitor Medan, was found dead in a ditch in the village of Lawe Dua in Aceh province on February 5. RSF urged “the authorities to do everything possible to shed light on his death, and to not rule out the possibility that he was murdered in connection with his work.” The victim’s wife told local media (Serambi Indonesia) that her husband had had a heated phone conversation about one of his stories with someone a month before. An autopsy showed he had sustained a blow to the head from a blunt object and injuries to the face. Skid marks were also found near the body. “They must also do what is necessary to guarantee the safety of journalists and freedom of information. 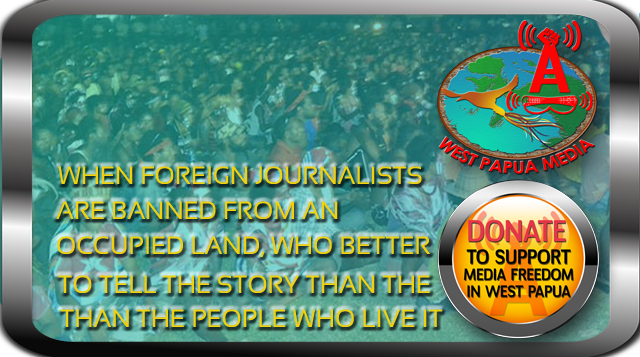 We are very worried by the problems for journalists throughout the country and in West Papua in particular,” RSF said. The group also also criticized the February 8 arrest in West Papua of Czech journalist Petr Zamecnik for taking photos of a pro-independence demonstration in Manokwari town in Papua region. The Czech reporter was subsequently deported. The demonstration protested the trail of prominent Papuans for their role in the peaceful convening of the “Third Papuan National Congress, October 16-19” (see report on the trial below). Photos of that demonstration from a separate source (see http://etan.org/issues/wpapua/2012/1203wpap.htm#photo ) reveal a peaceful, colorful demonstration. Indonesia imposes strict visa regulations on foreign visitors to Papua and tight restrictions on foreign journalists looking to report from the region. In 2010, two French journalists were deported from Papua for filming a peaceful demonstration outside government-approved areas. Reporters Without Borders ranks Indonesia 146th out of 179 countries in its latest Press Freedom Index. WPAT Comment: Pressure on international NGO’s attempting to work in West Papua (see above), in conjunction with the pressure on international journalists, are key to Jakarta’s continuing strategy, developed under the Suharto dictatorship, to prevent the world from witnessing its repressive policies in West Papua. Demonstrations were organized by Papuan students studying in Makassar, South Sulawesi, and in Jayapura (Port Nambay), the capital of Papua province. The students in Makassar, according to a Jakarta Post story contended that the new unit would not solve problems, but only create new ones, in part by providing opportunities for corruption as has the “Special Autonomy” policy itself. The February 20 Makassar demonstration was organized by the Student Solidarity Forum for Papuan People. The students reportedly called for a tri-partite dialogue to address problems in Papua to involving the central government, the Papuan people and Amnesty International. Meanwhile, thousands of Papuans in Jayapura on February 21 also called for the disbanding of the UP4B unit in a demonstration before the Papua Peoples Assembly (MRP) building. The demonstrators in Jayapura, like the Papuans in Makassar the day before also rejected “Special Autonomy” but added a call for a referendum on West Papua’s political future. The trial of Forkorus Yaboisembut and four others who organized the October 16-19, 2011 Third Papuan National Congress is increasingly lurching toward a juridical farce. The public prosecutor announced that he would pose criminal charges against Gustaf Kawar, one of the defendants’ principal lawyers. The prosecutor appears to be reacting to an incident on February 24 in which Kawar rebuffed the prosecutor’s attempts to interfere with the defense team’s cross examination of police witnesses. The defense team confronted the police witnesses with various facts, including that the meeting had proceeded peacefully and that police had severely mistreated Papuans who had attended the Congress. Earlier in the trail, the police whom the prosecution produced as witnesses proved to be less than effective. Six of these witnesses were unable to answer questions from the chief persecutor regarding the declaration regarding Papuan independence that was allegedly read out at the end of the conference nor could they say whether the five defendants had been involved in a criminal conspiracy to set up the Federal Republic of West Papua. One of the witnesses who had been summoned was a member of the Papuan People’s Assembly (MRP). Due to his membership in that body he was disallowed as a prosecution witness. The defense team successfully argued that inasmuch as the MRP is a cultural, and since the trial was related to the political aspirations of the Papuan people, that MRP member’s appearance might cause a conflict between the MRP and the Papuan people. According to a lengthy report of the hearing in Bintang Papua, the police witnesses appeared not to know the defendants and were unaware of the declaration by Forkorus calling for the re-establishment of the Federal Republic of West Papua. According to Bintang Papua, the first witness, member of the Jayapura City police force, admitted that he did not know the identity of one of the accused, Agustinus Sananay Kraar. The World Council of Churches (WCC) Executive Committee recently issued a statement expressing concern over the escalation of violence in Tanah Papua (West Papua). The organization urged the Indonesian authorities to stop the killings of civilians at the hands of armed forces and protect the rights of Papuan people. The report described how Papuans has suffered economic deprivation since the times of the Suharto dictatorship which developed a policy of “transmigration” whereby non-Papuans were transferred from other islands into West Papua,rendering Papuans a minority in their own land. “Over the past several years the Papuan people have been demanding freedom of expression and the right to self determination, but the demands for their legitimate rights have been continuously suppressed by the Indonesian authorities,” reads the statement. The statement was released during a WCC Executive Committee meeting in Bossey, Switzerland, which took place from 14 to 17 February. He called the launch “overdue,” adding “We’re talking about a country where people get 15 years in jail for raising a flag, where on all common analyses of Indonesian society it is the second worst province in regards to longevity of people’s life, child, infant mortality, income levels.” Ferguson said that there are about 60 West Papuans being held as political prisoners and described allegations of heavy militarization of the province. The launch was welcomed in West Papua. 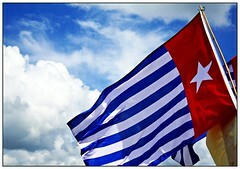 In Biak, demonstrators carried the banned morning star flag and signs in English welcoming the launch. They called the 1969 “Act of Free Choice,” the fraudulent exercise through which Indonesia annexed West Papua, “illegal.” Demonstrators also peacefully took to the streets in Jayapura and in Timika where demonstrators flew the flags of Australia, New Zealand and Vanuatu. In Fak Fak, at least ten Papuans were arrested on March 1 after peaceful February 28 demonstrations welcoming the formation of the IPWP chapter in Australia. 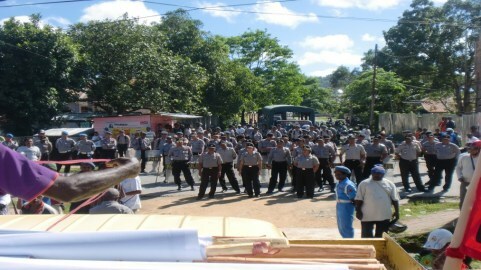 The demonstrators also reportedly protested the formation of the U4PB (see above).